Located in Ontario, California, Scandia Amusement Park is a Scandinavian-themed family fun center and amusement park offering more than 25 attractions, including thrill and midway rides, a miniature golf course, and an arcade facility. The Scandia corporation was founded in 1977 by three California Scandinavian families wishing to bring a family-friendly Scandinavian-themed attraction to the greater southern California region. Throughout its existence, the Scandia corporation has been dedicated to the creation of family-friendly community attractions and humanitarian outreach with missionary organizations throughout North America. 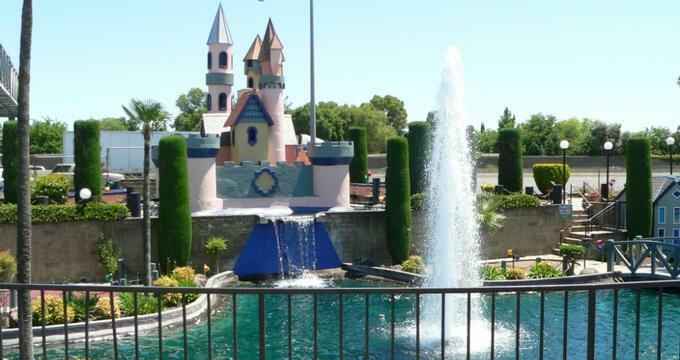 In 1979, the first Scandia Family Fun Center was opened outside of Sacramento, California near Interstate 80, a nine-acre property featuring attractions such as midway and thrill rides, a miniature golf course, and a classic arcade. Throughout the late 20th century, the park became a popular tourist destination stop along the route to Lake Tahoe. Following the initial location’s success, two more amusement center locations were opened in nearby Ontario and Victorville, including a full amusement park facility at the Ontario location. Today, the Scandia corporation operates three amusement center facilities throughout southern California, including the Scandia Amusement Park facility in Ontario. More than 25 family attractions are offered at the park, including a variety of high and mild thrill rides, a miniature golf course, and an arcade facility. The park is open to the public daily weather-permitting, with different hours available for different park attractions. Two roller coasters are offered at the park, including the Scandia Screamer classic midway steel coaster and the Little Dipper Coaster children’s roller coaster. Other major thrill rides include a Swedish Swing dual-armed slingshot ride, a Cliff Jumper drop tower, a Viking Ship pirate boat ride, and a Nordic Spaceship indoor dark gravity ride. Several classic midway rides are also offered, including Olga’s Tilt-a-Whirl, the Copenhagen Carousel, and a Lapland Landslide midway slide. Children’s rides include the Skagarrak Zoo flying circular ride, the Norway Flyer miniature airplane ride, the Denmark Railway miniature railroad and Hagar’s Truck Company truck track ride, and the Oslo Fire Department flat ride. The park’s Stockholm Raceway offers go-karting experiences for passengers over 36 inches, with a minimum driving height of 54 inches.Baltic Sea Bumper Boats are available for rental and use along the park’s waterway, and 18 computer-controlled Batting Cages offer fast and slow pitch baseball and softball experiences. Two landscaped miniature golf courses showcase Scandinavian-themed obstacles and more than 12,000 annually planted flowers, along with a variety of stream, river, and waterfall features. The park’s Grand Arcade also features more than 150 skill, sport, and video games which offer tickets that may be redeemed for prizes such as plush toys, candy, and electronics. Standard American fare is served at several restaurants on the park’s grounds, including The Scandia Grill and Olga’s Kitchen. A picnic area is also available on site, offering table seating at a 200-seat pavilion. In addition to standard visitor admission, group admission rates are available for small groups and organizations, including schools and community groups. Educational field trip tour experiences for elementary school groups are offered, featuring guided tours and attraction activities led by experienced educators emphasizing Common Core curriculum standards. Group picnics may be hosted at the park’s picnic pavilion, with packages available for event setup and cleanup, picnic games, and volleyball equipment rental. Group special events may be accommodated by reservation, including graduation night events, school and day camping trips, and year-end class parties. Young visitors wishing to celebrate their birthdays at the park may rent park facilities as part of several birthday party packages, including use of party rooms, pizza and ice cream for guests, and access to park attractions. Additional benefits are offered to the birthday child as part of party packages, including extra arcade tokens, souvenir cups, and return one-day park passes for an additional visit. A minimum of five guests must attend all birthday parties, and a non-refundable $50 deposit is required for all party reservations. Additional food deals may be added onto birthday party packages for an extra fee. In addition to the Ontario facility, two other amusement centers are owned by the Scandia corporation, including the Scandia Family Fun Centers in Victorville and Sacramento. Attractions at the Victorville location include a Crow’s Nest spinning pendulum ride, a Stockholm Raceway go-kart track, and Baltic Sea Bumper Boats. Sacramento attractions include a Crazy Dane mouse coaster, a Swedish Scrambler, and a Norway Flier flying scooters ride. Both facilities offer miniature golf courses, batting cages, and redemption arcades, along with restaurant and picnic pavilion facilities. Group event rentals and birthday party packages may be reserved at either Family Fun Center location.